Atocha Station (Spanish: Estación de Atocha) is the largest railway station in Madrid. It is the primary station serving commuter trains (Cercanías), intercity and regional trains from the south, and the AVE high speed trains from Barcelona (Catalonia) and Seville (Andalusia). These train services are run by the Spanish national rail company, Renfe. The station was Madrid's first railway station. It was inaugurated on 9 February 1851 under the name Estación de Mediodía (Atocha-Mediodía is now the name of an area of the Arganzuela district, and means in old Spanish south). After the building was largely destroyed by fire, it was rebuilt and reopened in 1892. The architect for the replacement, in a wrought iron renewal style was Alberto de Palacio Elissagne, who collaborated with Gustave Eiffel. Engineer Henry Saint James also took part in the project. This old building was taken out of service in 1992 and converted into a concourse with shops, cafés, a nightclub, and a 4,000 m² covered tropical garden. A modern terminal by Rafael Moneo, designed to serve the new AVE trains to Seville, was added to the complex. The main lines end in the new terminal; commuter train platforms are located underground, at the ingress to a rail tunnel extending northward under the Paseo de la Castellana. The station, located on the Plaza del Emperador Carlos V, is served by two Madrid Metro stations, Atocha and Atocha Renfe. The latter was added when the new terminal building was constructed and is directly linked to the railway station. The Reina Sofía museum is in the vicinity of Atocha. The station was in the International Media because of the 11 March 2004 Madrid train bombings. On 10 June 2004, a virtual shrine was dedicated by the Spanish Minister of Transport. Visitors to the attacked stations can leave a hand silhouette and a message through special-purpose consoles. The Hotel Villa Real is housed in a grand building, sensitively designed to blend with the surrounding architecture, in the centre of the museum triangle 300 metres from the Prado. Madrid's finest museums are on the doorstep: the Thyssen Museum (fine art) is just 100 metres away and the Reina Sofia 400 metres. 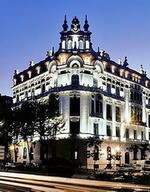 Madrid's main square, Puerta del Sol, is also 400 metres from the hotel. Guests can escape the hustle and bustle of the city and relax over drinks in East 47 restaurant and cocktail bar, a cosmopolitan space offering modern European cuisine and an impressive collection of Warhols. The hotel is filled with all kinds of art, sculptures and mosaics, and wireless Internet is available in public areas for guests who wish to stay in touch. Built as a palace in 1908 and converted into a hotel in 2004, the AC Palacio del Retiro is a national heritage site, which features original sweeping marble staircases and stained glass windows. 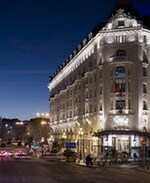 The hotel is situated in the city centre, 300 metres from the Prado Museum. The Reina Sofia Art Centre is 500 metres away, and the Running of the Bulls takes place at Plaza de Toros, five kilometres away. Guests can work out in the fitness centre and then unwind in the sauna. Those seeking total relaxation can indulge in a variety of spa and massage treatments, including in-room massages. Diners can enjoy modern Mediterranean cuisine in a relaxed setting at the restaurant Indice. Before dinner, guests can enjoy cocktails in the bar, or relax and take advantage of 24-hour room service. Parents will appreciate the babysitting service. 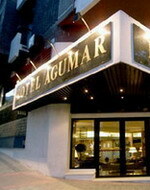 The Hotel Aqumar, Madrid is a modern, eleven-floor wonder and is located next to the Parque Del Retiro, just 200 meters from Atocha-Ave railway station and around the corner from the Prado museum. Many of Madrid's finest attractions are within easy reach of the hotel, including the Queen Sofía Art Centre, the Thyssen-Bornemisza Art Gallery, and the Botanical Gardens. Patrons of Hotel Agumar can relax with a drink in the bar, enjoy international cuisine in the restaurant or hit the dance floor at the hotel's own disco. 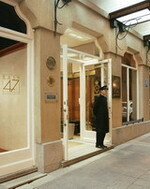 The hotel provides 24-hour room service, and newspapers in public areas. The hotel's 245 guestrooms are decorated in a variety of styles and feature interactive TV with pay movies. The Hotel Paseo del Arte is a contemporary mid-rise hotel situated in the Golden Cultural Triangle, 800 metres from El Prado, Spain's largest and most famous museum. The Reina Sofia museum of contemporary art, housing works by renowned Spanish artists including Goya, Picasso and Dali, is 300 metres from the hotel, while Pollock, Rothko and Caravaggio can all be found at the Thyssen-Bornemisza Museum, 700 metres away. The famous Casa de Campo, a vast open space offering an amusement park, cable cars and a zoo, is three kilometres from the hotel. Madrid Barajas Airport is 15 kilometres away, with an approximate driving time of 30 minutes. 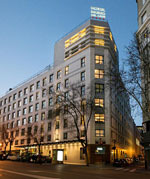 The modern Rafaelhoteles Atocha is located within one-and-a-half kilometres of the "big three" Madrid museums, the Prado, Reina Sofia and the Thyssen-Bornemiza in Madrid, Spain. Atocha rail and metro station is 800 metres from the hotel, and Madrid Barajas Airport (MAD) is 10 kilometres away. 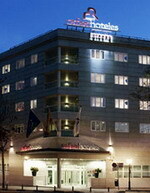 A five-storey white brick hotel, Rafaelhoteles Atocha has a corner entrance. Glass doors lead into a large, spacious lobby with marble floors, front desk, seating and complimentary newspapers. The hotel has a terrace at the rear. El Azafran restaurant at Rafaelhoteles Atocha offers Mediterranean and international flavours, specialising in rice dishes. With dark red walls, cream tablecloths, the restaurant is open for breakfast, lunch and dinner. The hotel's bar is open for relaxing drinks. Overlooking the Neptune Fountain and its quiet plaza, the Westin Palace lies opposite the Prado and Thyssen-Bornemisza museums and is two blocks from the Reina Sofia Art Centre. The palatial hotel was built in 1912 on the former site of the palace of the Duke and Duchess of Medinaceli. The entrance hall, decorated with murals of Italian Renaissance gardens, leads through to Rotunda Hall which is crowned with an Art Nouveau glass dome. Dining options include international and Spanish dishes at the informal La Rotonda, and Chinese cuisine at Asia Gallery. A complimentary breakfast is served daily. Set in the most dramatic room of the hotel, the Palace Bar is dominated by an Art Nouveau stained-glass dome with flower motif, from which a large chandelier is suspended. Cocktails, and a choice of over 700 wines from the adjoining cellar, are served here, and live piano music is played for afternoon tea. Club Neptuno fitness centre is open round the clock and offers rooftop views across the Buen Retiro Park. The Jardines del Buen Retiro or Parque del Buen Retiro (literally "Gardens" or "Park of the Pleasant Retreat"), or simply El Retiro, the "Lungs of Madrid", is the main park of the city of Madrid, capital of Spain. The Parque del Buen Retiro is a large and popular 1.4 km2 (350 acres) park at the edge of the city center, very close to the Puerta de Alcalá and not far from the Museo del Prado. A magnificent park, filled with beautiful sculpture and monuments, galleries, a peaceful lake and host to a variety of events, it is one of Madrid's premier attractions. The park is entirely surrounded by the present-day city. Close to the northern entrance of the park is the Estanque del Retiro ("Retiro Pond"), a large artificial pond. Next to it is the monument to King Alfonso XII, featuring a semicircular colonnade and an equestrian statue of the monarch on the top of a tall central core. Buy at AllPosters.com The Rosaleda rose garden. Among the many rose bushes of all kinds stands the Fountain of the Falling Angel, erected in 1922, whose main sculpture El Angel Caído (at the top) is a work by Ricardo Bellver (1845–1924) inspired by a passage from John Milton's Paradise Lost, which represents Lucifer falling from Heaven. The few remaining buildings of the Buen Retiro Palace, including Casón del Buen Retiro and the Museo del Ejército, now house museum collections. The Casón has a collection of 19th and 20th century paintings, including art by the Spanish painter Joaquín Sorolla. The Ejército is one of Spain's foremost Army museums and it houses "La Tizona" the sword of the famous Spanish warrior El Cid. There are displays of armor, a cross carried by Christopher Columbus on his sea voyage to the New World and other artifacts. Since assuming its role as a public park the late 19th century, the "Parque del Retiro" has been used as avenue for various international exhibitions. Several emblematic buildings have remained as testimony to such events, including the Minig building, popularly know as the Velázquez Palace (1884) by architect Ricardo Velázquez Bosco, and the Palacio de Cristal ("Crystal Palace"), a glass pavilion inspired by The Crystal Palace in London, undoubtedly the gardens' most extraordinary building. Built along with its artificial pond in 1887 by architect Ricardo Velázquez Bosco for the Philippine Islands Exhibitions, it was first used to display flower species indigenous to the islands. The landscape-style gardens located in the former "Campo Grande" are also a reminder of the international exhibitions that have taken place here in the past. The Paseo de la Argentina, also popularly known as Paseo de las Estatuas ("Statue Walk"), is decorated with some of the statues of kings from the Royal Palace from the Royal Palace, sculpted between 1750 and 1753. There are now art galleries in the Crystal Palace, Palacio de Velázquez, and Casa de Vacas. In the Retiro Park is also the Forest of the Departed (Bosque de los Ausentes), a memorial monument to commemorate the 191 victims of the 11 March 2004 Madrid attacks. From late May through early October, every Sunday at midday, the Banda Sinfónica de Madrid gives free concerts from the bandstand in the park near the Calle d'Alcala. The Park features an annual Book Fair. Around the lake, Retiro Pond, many puppet shows perform, and all manner of street performers and fortune tellers. Rowboats can be rented to paddle about the Estanque, and horse-drawn carriages are available. 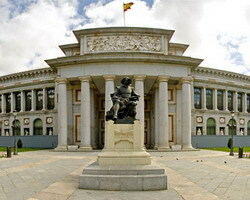 The Museo del Prado is a museum and art gallery located in Madrid, the capital of Spain. It features one of the world's finest collections of European art, from the 12th century to the early 19th century, based on the former Spanish Royal Collection. Founded as a museum of paintings and sculpture, it also contains important collections of more than 5,000 drawings, 2,000 prints, 1,000 coins and medals, and almost 2,000 decorative objects and works of art. Sculpture is represented by more than 700 works and by a smaller number of sculptural fragments. It is one of the most visited sites in Madrid. With about 1,300 paintings on display in the museum, the museum's world class status is secured. The Prado has easily the world's finest collection of Spanish painting, with large numbers of the finest works of Diego Velázquez and Francisco Goya, as well El Greco, Bartolomé Estéban Murillo, Jusepe de Ribera, Francisco de Zurbarán, and most other leading Spanish old masters. There are also large groups of important works by the Dutch painter Hieronymus Bosch (a personal favorite of King Philip II of Spain), Titian, Peter Paul Rubens, Raphael, and Joachim Patiner. Fine examples of the works of Andrea Mantegna, Botticelli, Caravaggio, Guido Reni, Albrecht Dürer, Rembrandt, Orazio Gentileschi, Artemisia Gentileschi, Veronese, Hans Baldung Grien, Fra Angelico, Antonello da Messina, Van der Weyden, Nicolas Poussin, Claude Gellée, Thomas Gainsborough, Thomas Lawrence, and many other notable artists are also on display in the museum. The best known work on display at the museum is Las Meninas by Velázquez. Velázquez not only provided the Prado with his own works, but his keen eye and sensibility was also responsible for bringing much of the museum's fine collection of Italian masters to Spain. The Museo del Prado is one of the buildings constructed during the reign of Charles III (Carlos III) as part of a grandiose building scheme designed to bestow upon Madrid a monumental urban space. 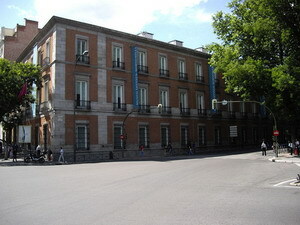 The building that lodges the Museum of the Prado was initially conceived by José Moñino y Redondo, conde de Floridablanca and was commissioned in 1785 by Charles III for the reurbanización of the Paseo del Prado. To this end, Charles III called on one of its favorite architects, Juan de Villanueva, author also of the nearby Botanical Garden and the City Hall of Madrid. The prado ("meadow") that was where the museum now stands gave its name to the area, the Salón del Prado (later Paseo del Prado), and to the museum itself upon nationalisation. Work on the building stopped at the conclusion of Charles III's reign and throughout the Peninsular War and was only initiated again during the reign of Charles III's grandson, Ferdinand VII. The structure was used as headquarters for the cavalry and a gunpowder-store for the Napoleonic troops based in Madrid. The Thyssen-Bornemisza Museum, or in Spanish Museo Thyssen-Bornemisza, is an art gallery near the Prado Museum in Madrid. It is known as a part of the "Golden Triangle of Art", which also includes the Prado and the Reina Sofia galleries. The Thyssen-Bornemisza fills the historical gaps in its counterparts' collections: in the Prado's case this includes Italian primitives and works from the English, Dutch and German schools, while in the case of the Reina Sofia the Thyssen-Bornemisza collection, once the second largest private collection in the world after the British Royal Collection, includes Impressionists, Expressionists, and European and American paintings from the second half of the 20th century, with over 1,600 paintings. The competition was won after in 1986 Baron Thyssen having tried to enlarge his Museum in Villa Favorita and searched for a location in Europe. The collection started in the 1920s as a private collection by Heinrich, Baron Thyssen-Bornemisza de Kászon (1875–1947) and later expanded by his son Baron Hans Heinrich Thyssen-Bornemisza (1921–2002), who assembled most of the works from his relatives' collections and proceeded to acquire large numbers of new works to produce what is one of the world's finest private art collections. In 1985, the Baron married Carmen Cervera (a former Miss Spain 1961) and introduced her to art collecting. Carmen's influence was decisive in persuading the Baron to decide on the future of his collection and cede the collection to Spain. The museum was opened in 1992 after an agreement was reached between the Baron and the Spanish government. A year later the collection was bought outright. The Baroness remains involved with the museum. She personally decided the salmon pink tone of the interior walls and in May 2006 publicly demonstrated against plans of the Mayor of Madrid, Alberto Ruiz-Gallardón to redevelop the Paseo del Prado as she thought the works and traffic would damage the collection and the museum's appearance. One of the focal points is the early European painting, with a major collection of trecento and quattrocento (i.e. 14th and 15th century) Italian paintings by Duccio, and his contemporaries, and works of the early Flemish and Dutch painters like Jan Van Eyck, Albrecht Dürer, and Hans Holbein. Other highlights include works by the most famous Renaissance and Baroque painters, including Titian, Sebastiano del Piombo, Caravaggio, Rubens, Van Dyck, Murillo, Rembrandt and Frans Hals and wonderful portraits by Domenico Ghirlandaio and Vittore Carpaccio. Also important for the Museum's collection are Impressionist and Post-Impressionist works by artists like Claude Monet, Auguste Renoir, Edgar Degas and Vincent Van Gogh, as well as twentieth century masterpieces like a Cubist work by Picasso or late works by Piet Mondrian and Edward Hopper. A collection of works from the museum are housed in Barcelona in the Museu Nacional d'Art de Catalunya. The Museo Nacional Centro de Arte Reina Sofía (MNCARS) is the official name of Spain's national museum of 20th century art (informally shortened to the Museo Reina Sofía, Queen Sofia Museum, El Reina Sofia, or simply The Sofia). The museum was officially inaugurated on September 10, 1992 and is named for Queen Sofia of Spain. It is located in Madrid, near the Atocha train and metro stations, at the southern end of the so-called Golden Triangle of Art (located along the Paseo del Prado and also comprising the Museo del Prado and the Museo Thyssen-Bornemisza). The museum is mainly dedicated to Spanish art. Highlights of the museum include excellent collections of Spain's two greatest 20th century masters, Pablo Picasso and Salvador Dalí. Certainly the most famous masterpiece in the museum is Picasso's great painting Guernica. 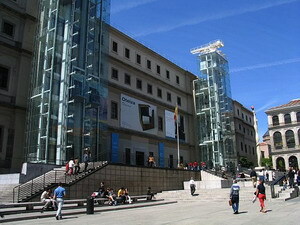 The Reina Sofía also has fine collections of the works of Juan Gris, Joan Miró, Julio González, Eduardo Chillida, Antoni Tàpies, Pablo Gargallo, Lucio Muñoz, Luis Gordillo, Jorge Oteiza, José Gutiérrez Solana and many other significant artists. Foreign artists are few, but there are works by Robert Delaunay, Yves Tanguy, Man Ray, Jacques Lipchitz, Lucio Fontana, Yves Klein, cubist still-lifes by Georges Braque and a large work by Francis Bacon. It also hosts a free-access library specializing in art, with a collection of over 100,000 books, over 3,500 sound recordings and almost 1,000 videos. The central building of the museum was an 18th century hospital. Extensive modern renovations and additions to the old building were made starting in 1980. In 1988 portions of the new museum were opened to the public, mostly in temporary configurations; that same year it was decreed a national museum. An 8000 m2 (86,000 ft2) expansion costing €92 million designed by French architect Jean Nouvel opened October 2005.